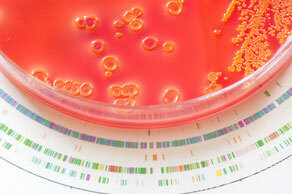 The ability to sequence whole microbial genomes has revolutionized biology. Sequencing the genome of a microorganism is important to reveal its physiological potential or conduct comparative phylogenomic studies. We offer analysis of whole genome data resulting from individual microorganism or communities (Shotgun- Metagenomics, Shotgun Metatranscriptomics). We assemble high-quality draft genomes of your microbes of interest, both de-novo(without reference) or reference-guided. We make use of paired-end as well as mate-pair libraries to get concise assemblies. Following assembly, we identify relevant genomic features of your microbial genome and provide them in formats ready for downstream analysis. Furthermore, we provide you with Circos plots of these genomic features and take care of data submission to Genbank or DDJB. Ask our scientists for our bacterial genomic service. If you would like to learn how to do bacterial genome assembly and annotation, we will be happy to consult you.